Medical marijuana user Skye Bergen pictured in Edmonton Alberta, November 16, 2017. Bergen would like to see the government legalize mail order marijuana. Jason Franson/The Globe and Mail. A vendor trims marijuana with scissors during the annual 4-20 cannabis culture celebration at Sunset Beach in Vancouver on April 20, 2017. As provinces reveal their plans for legal marijuana, many governments are keeping a potentially lucrative online market in their control. A small, nondescript parcel arrives at the doorstep of Candice Beyer's Edmonton home every couple of months. She signs for the delivery, then quickly and quietly squirrels the shrink-wrapped, odourless package away in a secret drawer. The mother of three says the cannabis helps her unwind on the odd Saturday night when her kids are out of her hair, a comfort she likens to the glass of wine other parents might enjoy. 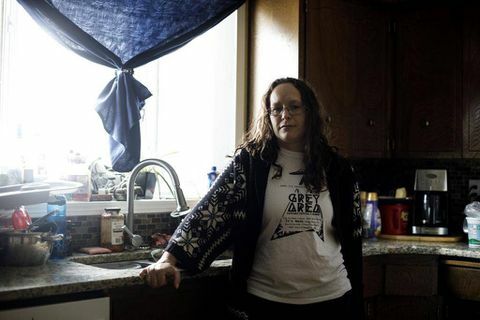 She's not a medical-cannabis patient, so she has no way to get the drug legally. She's not keen on buying from a street dealer, and with no illegal cannabis dispensaries in Alberta, Ms. Beyer sought out one of the dozens of underground Canadian companies selling the drug online and started getting the special deliveries about a year ago. "I've never liked the idea of buying it off of random people [on the street] that I don't really know or trust," she said. Ms. Beyer is exactly the type of customer that governments hope to bring out of the black market once recreational cannabis is legalized next year. As provinces reveal their plans for how they will allow cannabis to be sold, much of the focus has been on bricks-and-mortar retail stores and whether they should be private or public. However, online sales might be as lucrative – or more so – as people already accustomed to shopping online look for a way to get the drug easily and, for the most part, anonymously. And in almost every province that has announced its plans for legal cannabis, provincial governments are keeping exclusive control of the online market – and the profits. Canada's cannabis black market is estimated at about 400,000 kilograms a year, though it's not clear how much of that is from online sales from dispensaries, which ship their products undetected through Canada Post. That's on top of the legal medical cannabis system, which shipped 33,000 kilograms of product to 168,000 patients across the country last year. Here is a glance at provincial and territorial plans to date for legal marijuana. – Ontario, the first province to outline its intentions, intends to sell the drug in up to 150 stores run by the Ontario Liquor Control Board to people 19 and older, with a ban on its consumption in public spaces or workplaces. – New Brunswick has proposed legislation that would set the minimum age at 19 and require users to lock up their marijuana when at home. A legislature committee has recommended selling marijuana through government-operated stores. – Manitoba Premier Brian Pallister said marijuana would be sold in the province exclusively through private-sector retail outlets and online stores. The government will maintain a wholesale monopoly and regulate distribution, but private stores will sell the drug at a price they can set themselves. Municipalities can ban marijuana stores if they want and cannabis will not be allowed to be sold in the same stores as alcohol. – Quebec has tabled a bill whereby all pot would be sold through the provincially-run liquor board, although there is flexibility for exceptions. Quebec plans to open 15 marijuana stores by July 1 and control sales online. The bill also makes it illegal to cultivate pot for personal or commercial use, unless authorized, and limits possession in a home to 150 grams and to 30 grams on a person. There will also be a zero-tolerance policy for driving under the influence of any drug. – Alberta plans to control the online sale of pot, but will leave over-the-counter sales to private operators. Details on how sales would work have yet to be determined. Private pot stores would have to be physically separate from stores that sell alcohol, tobacco or pharmaceuticals — but how that would be legally defined is also undetermined. Stores would not be allowed to sell anything but cannabis and cannabis-related products. – British Columbia's NDP minority government hasn't come out with a set marijuana policy since forming government this summer, but Premier John Horgan has said he supports a hybrid model of public and private operations, much like the province's current liquor regulations. Licensed medical cannabis growers across the country have been telling provincial governments they have the capacity and expertise to run online sales directly to consumers. So far, all provinces except Manitoba have opted for a public system of online sales meant to capture consumers such as Ms. Beyer. British Columbia, long home to the country's largest illicit cannabis industry, has yet to unveil its plans, but has signalled it favours a mix of public and private retailers similar to the model Alberta has proposed. On Thursday, Alberta introduced a hybrid system in which the province runs online sales and allows private businesses – including licensed cannabis producers – to operate special stores where the drug is sold separately from tobacco, pharmaceuticals or alcohol. The provincial government said this strikes a balance between bolstering its entrepreneurial image – in a place where consumers are long accustomed private alcohol sales – and providing the oversight needed to ensure legal cannabis stays out of the hands of minors, which is one of Ottawa's key priorities behind this historic policy shift. To do that, government workers may end up delivering the cannabis. Alberta has not decided whether it will mark up online product to match its competitors in private storefronts, but Justice Minister Kathleen Ganley told reporters Thursday that, especially in the first few years, as the legal market is established, the costs to the provincial government – in terms of areas such as policing, education and health care – will exceed any revenues. Ms. Ganley said the province does not yet have a forecast for revenues from online sales and her spokesperson said no business case was available for this nascent public enterprise. Potential profits from online sales would be over and above tax revenue. Ottawa has proposed an excise tax of roughly 10 per cent, split evenly with the provinces. Provincial governments say that share would be insufficient, since they have to deal with all of the issues related to legalization, including law enforcement, public health and establishing a regulatory framework and system of sales. 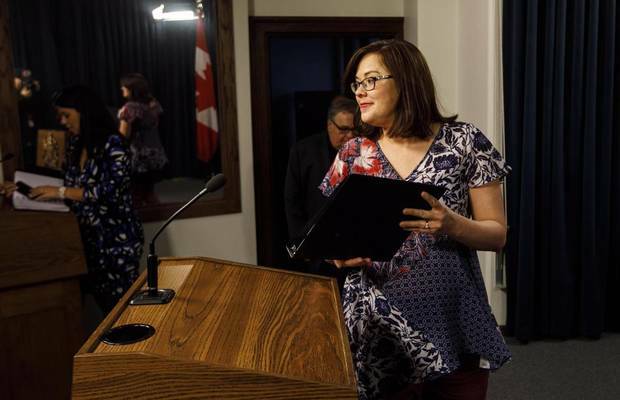 Alberta Justice Minister Kathleen Ganley makes her way to the podium to provide details of the proposed cannabis legislation in Edmonton Alta, on Thursday Nov. 16, 2017. A consortium of 12 licensed medical cannabis producers had pitched Alberta and B.C. on allowing them to run a co-operative network of stores with an e-commerce platform to sell the drug at no extra cost to the provincial government, even floating the idea of a profit-sharing dividend. Pierre Killeen, vice-president of corporate communications at Quebec-based Hydropothecary and spokesman for the Canadian Cannabis Co-op, said it is natural for governments to want to retain tight control of all facets of the market at the dawn of legalization. A spokesperson for Liquor Stores N.A. Ltd., Alberta's largest chain of alcohol retailers, declined to comment on his company's plans for this new sector. Jeremy Jacob, president of the country's largest dispensary trade group, the Canadian Association of Medical Cannabis Dispensaries, said a government-controlled online sales system runs contrary to the spirit of free enterprise and will push black-market retailers to continue operating outside the regulatory environment. "What other industry would you be given the right to retail, but not online?" he said. "Unless [governments] can show that private businesses will not be able to do age verification, then it seems to me that there would be no clear reason for the provinces to reserve retail for themselves other than to gain the revenue." Alberta's hybrid approach seems much more sensible than that of Ontario, New Brunswick and Quebec, where in-person and online sales will be run solely by the government, according to Anindya Sen, an economist at the University of Waterloo who studies public intervention in markets. "If Amazon is any indication, [online] is definitely where retail is going," he said. Medical marijuana user Skye Bergen pictured wants to the government legalize mail-order marijuana. Whereas the Eastern provinces will want to keep online and in-person pricing level, so one arm of their public sales system doesn't vastly outperform the other, Alberta can dictate the market price it wants private retailers to meet through what it charges on its government website, Prof. Sen said. "It's a smart move because they won't have any overhead and, if they set prices a bit lower, they can ensure that the bricks-and-mortar retailers will also ensure that they keep their prices low," he said. "From that perspective, it's very useful to control black-market growth." Rielle Capler, a University of British Columbia PhD candidate who has been studying how Canadians access legal and illicit cannabis for almost two decades, said provincial governments may be damaged politically for creating retail systems that make it easier for people to buy cannabis, but that is the only way the black market will be squeezed out. "They have to look at the evidence and not the politics," she said. A study published in the March, 2016, issue of the peer-reviewed journal Health Affairs found that U.S. states with less government control over legal cannabis sales saw more people join the regulated market, she said. She added that some people will continue to fear and distrust any government involvement in the cannabis market as long as criminal penalties related to the drug exist. Skye Bergen says she has a prescription to use the federal e-commerce system for medical cannabis, but she says her trusted street dealer has more strains, which she can get cheaper and faster than from one of the country's six dozen licensed commercial growers. The Edmonton mother of two says some of the licensed firms are better than others, but the price must come down and shipping times must be cut drastically for any legal medical or recreational market to beat out its underground competitors. "It doesn't make sense to put that order in and wait for a week and a half to two weeks when I can call somebody and have them come to me," she said. 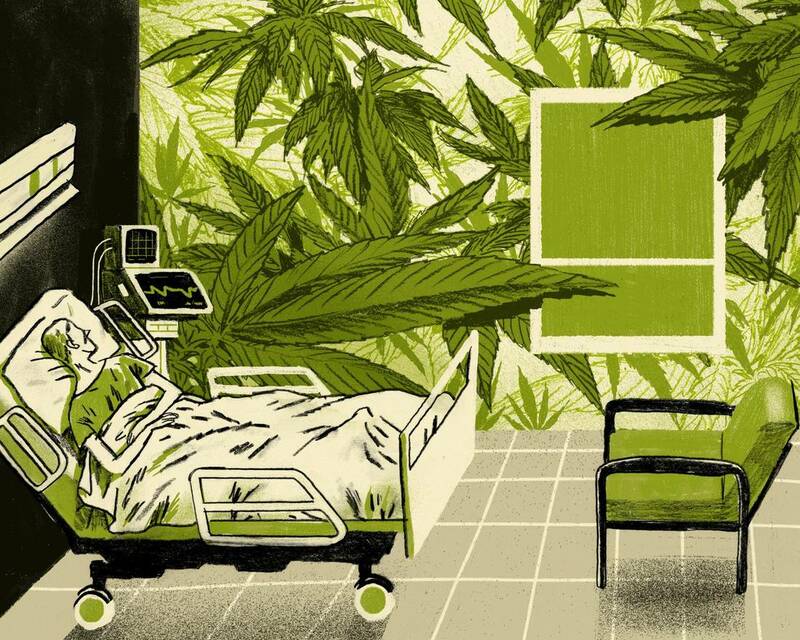 Cannabis and cancer care: What the science says With legalization on the horizon in Canada, dispensaries are marketing marijuana as a cure for what ails you – including cancer. Do the claims hold up?